Located on 4000 acre Lake Winnisquam in Laconia NH on Leighton Ave. This Classic Lakeside Seasonal Cottage is ready for you to move in. 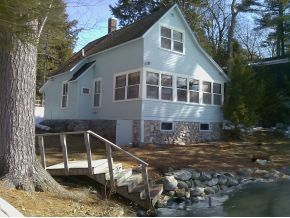 Built in the 1940's this 5 room 3 bedroom cottage has 133 feet of shoreline on .53 acres. The bedrooms are typical of this type of cottage with having to go through one bedroom to get to the others. The kitchen and living area are good size and really nice if you are planning on many people through the doors. Western exposure with wonderful sunsets directly across the way. Sandy Beach and a protected cove with dock. Listed by Coldwell Banker. Being sold furnished and with row boat. 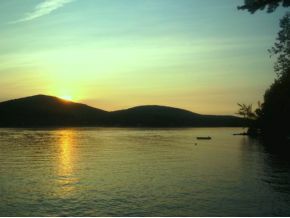 The location is ideal on the lake, a short drive you can be in Meredith or at Gunstock Ski Area. After your summer of boating you might want to come up for an afternoon of ice fishing or snowmobiling in the winter. For additional information on this home call Lady of the Lake Realty at 1-888-737-5550 or e-mail at info@nhlakesrealty.com or visit our website to view similar lake homes in New Hampshire at www.nhlakesrealty.com or www.lakeorskirealestate.com Contact us today to see if this home is still available? ?